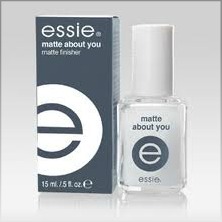 One of my good friends told me about the essie topcoat called 'matte about you', and I am so glad she did. Because I am in love with it. I really like this years matte polish trend, and with essie i can make all of my nail polish matte. The price is about $8, and you can buy it in most beauty stores and manicure salons.